Suresh has a degree in mathematics and is a gold medallist from the Vivekananda College, Madurai Kamaraj University. He aims to remove that 'Maths Fear' from the children's mind. 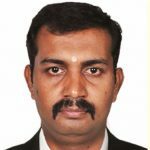 In this regard, he has travelled extensively to different schools across Tamil Nadu and have taken great efforts to instill confidence in students that maths can be learnt easily. He is the author of the bestseller 'Nodiyil Kanitham'. Recognised internationally as a best trainer in the field of maths, he has been invited for interviews in nationally syndicated radio and television programs. He has trained more than 3 lakh students and 10 thousand teachers in and around Tamil Nadu, India.